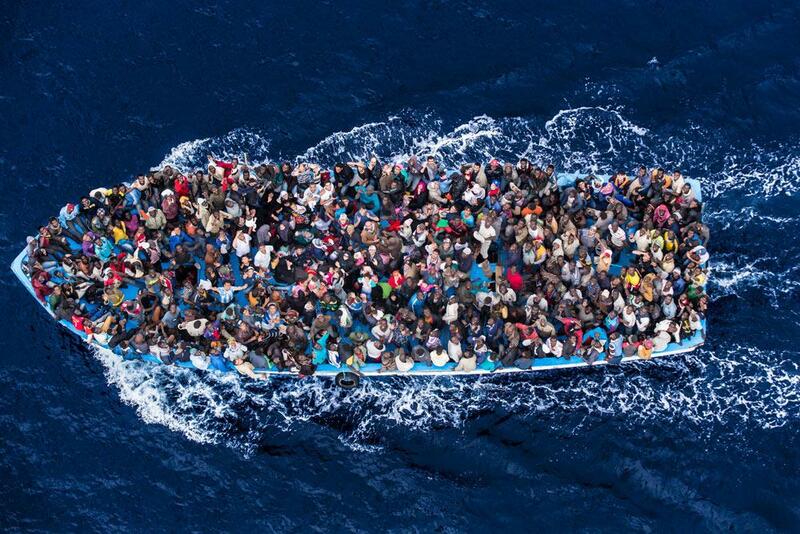 Between the 13th and 26th October, the EU is implementing a two week long joint police operation in order to find illegal immigrants. The campaign aims at hampering organized crime and human trafficking. From previous similar operations, there is however reason to fear that the operation will strike at the man in the street, the undocumented refugee, rather than the criminals. Politicians, journalists and human rights activists have protested against both the intervention as such and the secrecy of the affair. All Member States have been invited and Sweden is one of many participating countries. The operation was initiated by the Italians and it is launched under the Latin name Mos Maiorum. Now, words are meaningful. They carry messages, historic as well as contemporary. They transmit signals both within an organization and externally about what we are, what we do and what we aim to achieve. It comes as no surprise that the Italians have chosen to wrap up the campaign in a Latin package. The ancient world has always functioned as a cultural frame of reference, from which people, states and rulers have picked suitable symbols and slogans to strengthen communal identities, to legitimize power and to show off Bildung. Italy is of course particularly proud of its own Latin heritage. Past operations have taken up names of ancient gods and goddesses such as Hermes, Aphrodite and Demeter. Mos maiorum has a more specific historical meaning. The term literally means ”custom of the ancestors”. Mos is best translated as ”tradition, custom”. The plural is mores, as in morals, morality. Or think of Cicero’s classic O tempora, o mores!, Oh what times, oh what customs! Maiorum is plural genitive of maiores, ancestors. The term mos maiorum was used in ancient Rome, especially during the Republic and the early Imperial period. It worked as a moral guide in a highly flexible social system, where the manners of the forefathers were positive guiding principles that showed how Rome was best led for the good of the city-state and the people. Res publica, the Roman name of their Republic, means precisely that, the public things. To understand the concept of mos maiorum it is important to note that Rome lacked a common legal code before the 500s AD and the Corpus Iuris Civilis. Nor did it have a written constitution. Laws were certainly passed before this date too, but practice and rhetorical skills were often more decisive for the outcome of particular trials. The true power lay with the advisory body, the Senate, who published their resolutions as consulta, which were basically never questioned. The senators were former magistrates, in particular consuls and praetors. Their power was based on auctoritas, a reputation built on good judgment, age (senate comes from the word senex, old), moderation and dignity, which served as a model for present and future generations. Auctoritas was closely associated with mos maiorum, and senators could be excluded if they were caught with a non-irreproachable lifestyle. Morality was central in ancient Rome, and other citizens too could receive a written mark (nota) if they swore falsely, stole, attempted suicide, appeared on the stage, broke their promises or acted in other ways that were considered threatening to society. If the censors marked your name with a nota, you were removed from your voting ”tribe”, tribus, lost the right to vote but were still obliged to pay taxes. The censors guarded the moral behaviour of the Romans. Even if the censors lacked the formal power of imperium, the censorship was considered the most prestigious of all Roman magistracies. Its influence was built on auctoritas and mos maiorum. The censors were appointed for a longer period than the other magistrates, eighteen months instead of a year, and they could only be chosen among former consuls. Consequently, censors had reached a mature age and were well experienced. Up until Sulla’s dictatorship in 82 years BCE, censors were responsible for electing senators, they controlled the membership of the equestrian order, they were in charge of the census, and they pretty much controlled everyone’s social status by publically posting lists of senators and citizens with names of those excluded marked out. Age was in high regard, and few people possessed more real power than Marcus Aemilius Scaurus, praetor, consul, censor, and for about twenty-five years (from 115 BC), princeps senatus, the first man in the Senate, with the right to determine the agenda and to speak first. In Roman times, mos maiorum was by definition a positively charged concept. Ancestral customs and traditions had shaped Rome, and the ever-present moral decline was considered a threat to city and empire. The idea that Rome had lost its original strength by leaving the simple life by the plough to drink expensive wines from intricately decorated silver tableware at never-ending parties and games was a recurring theme in the literature. Ultimately, the importance of mores, customs, was linked to Rome’s military superiority. For a society that depended on the judgement, courage and discipline of generals and soldiers, old-fashioned customs were all about survival. Mos maiorum was the customs of the forefathers. Contemporary Romans often behaved worse. The well-known censor Cato the Elder (who in the 2nd century BCE argued that Carthage should be destroyed) strongly criticized the decay of his time and implemented reforms in order to have the Romans return to a simpler lifestyle. According to Cato, traditional values were found rather among the peoples who inhabited the rustic areas of Italy than in Rome itself. Mos maiorum was an ever-changing concept that indicated ideal character traits and patterns of behaviour of individuals and groups who had accomplished great things for society. The term was closely associated with Rome’s past, but parallel to the ever-growing complaint of the degeneration of contemporary times, high moral standards came to be associated with other peoples. Tacitus, in his renowned depiction of the people of Germania (around 100 AD), credits the northern neighbours rather than the Romans with the traditional virtues such as courage, justice, and moderation. Rome was a pre-modern society, imperialistic, militaristic, violent, misogynic, non-democratic, unequal. In Rome, there was little concern with the needs and dreams of the individual human being. Prejudices were innumerable. The Greeks were considered untrustworthy cowards, Orientals lacked independence and were depraved, the Carthaginians were cunning and cruel. But Rome was also a multicultural melting pot, an empire based on inclusion. The Romans put very little emphasis on race, so to argue that the term mos maiorum signals racism and fascism is historically incorrect. The Romans also rather easily adopted and incorporated the traditions, arts and gods of other people. Rome’s literary production was almost exclusively based on Greek models, and Horace famously concludes in his Epistle 2.1 (156-157) that ”the defeated Greece defeated the savage conqueror and introduced the arts in rustic Latium.” Rome’s ancestor, Aeneas, the main character of Vergil’s ”national epic” the Aeneid, had fled from the war at Troy in Asia Minor, and he sailed via Africa to Italy. In ancient times, the idea of closing the borders to Rome would have been unthinkable. 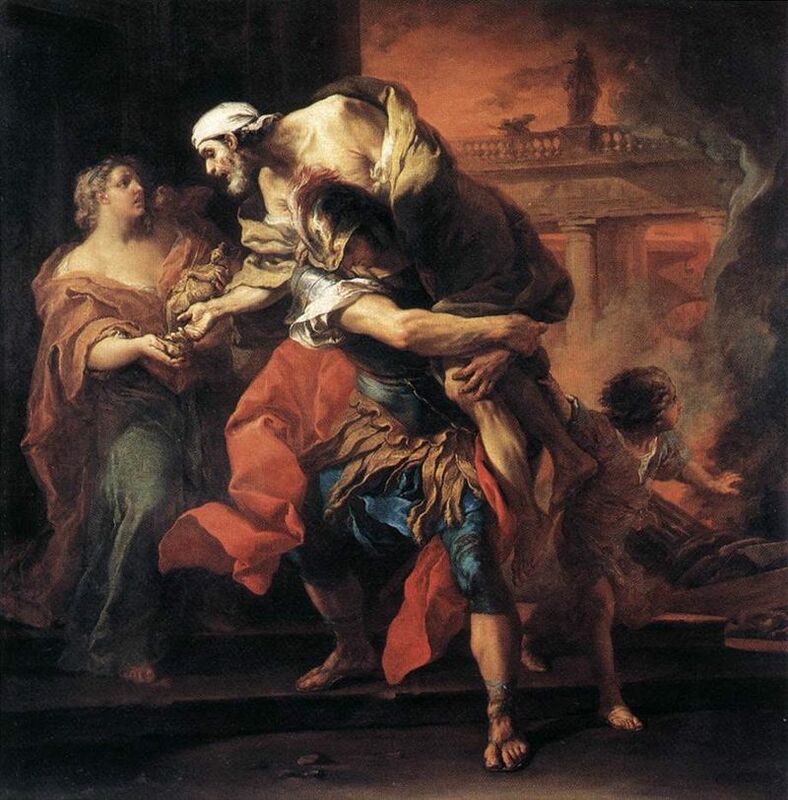 Aeneas flees from the scene of war at Troy, carrying his father Anchises on his back. At his sides, we see his son Ascanius and wife Creusa. Painting in the Louvre by Carle van Loo, 1729. To name an operation that aims to track down immigrants mos maiorum is deeply misleading from a historical perspective. Whose manners are we referring to, whose moral examples? Not the Romans, and they were the ones who minted and implemented the term. It also seems unlikely that mos maiorum was chosen to evoke a more recent example. By re-using a Latin term in a new setting, you not only rewrite history (by turning the Romans into protectionists), you also claim through the Latin itself, the language of power, of the church, the law, the university and the western world that you are morally rightful on historical precedents. EU:s version of mos maiorum is not based on auctoritas, nor on ancestral customs, but it is rather to be interpreted as exercising political and cultural control. Let me again quote Cicero: Oh what times, Oh what customs, O tempora, o mores! ← Vad är Mos Maiorum? Перед укладкой самого электропола необходимо привести в порядок поверхность, избавив её от впадин и холмов — она должна быть ровненькой Ремонт квартиры. Методы экономии при проведении ремонта. Mos maiorum might best be related to the unwritten law which is enforced in rural societies, or even the Natural Law which is hard-wired in our genes, with the variance in expressivity and penetrance which characterizes all inheritance. The Romans accepted foreigners with some suspicion, and demanded that they adapt their behavior to the Mos Maiorum. In the time of Hadrian, according to Gibbon, they complained about the intemperance of the Gauls, the the cunning and levity of the Greeks, the savage obstinacy of the Egyptians and the Jews, the servile temper of the Asiatics, and the dissolute effeminate prostitution of the Syrians… We wouldn’t stand for that today.